In what he confesses is a long post, but is still shorter than my normal post, Dave Black discusses how to translate the Greek word ekklesia, both in terms of an English word (he chooses “community”), and in practice. But then you have issues such as sexual abuse which must be dealt with, and we find that we really don’t have any idea what to do. In the several cases in which I have had the opportunity to discuss this, I have always come back to this: We cannot adequately deal with sin in the church because the church is not functioning as a community. There are many elements to this issue, including clergy-laity distinctions, or more precisely leadership-followership. We need to be looking at—and implementing—ways of making the church a functioning community. One characteristic (of many) of this would be that we do not excuse abuse by leaders. Our study continues tomorrow evening with a look at chapter 4 of Dave Black’s book Seven Marks of a New Testament Church, “Genuine Relationships.” In this chapter, Dave discusses the church as community. I wrote an extended post on it when I was blogging through the book some time ago. I recommend reading that, and paying particular attention to the definitions provided by Ruth Fletcher. I’ve quoted a key line in the featured image, but in that earlier post I quote more and discuss at greater length. I don’t know how to get millenials (and other generations younger than mine) into church. The reason is simple: I’m past 60 years old. I hear frequent complaints about the failing of the current (or other intervening) generation. Is it possible, however, that they’re just as smart as or as good as my generation (or even smarter and better), but they’re not willing to put up with doing something just because it has been done before. I actually love Sunday mornings and going to Sunday School and church. It’s part of getting myself ready for another week. But it is very much like it has been for decades. I can’t point out too many differences between the service I attended today and one I would have attended when I was in my late teens and early twenties. Church people respond, “But it’s not for you! It’s for God!” But where does it say God must be honored with the order of worship I experienced, and yes enjoyed. It’s quite easy to tell someone else they ought to do out of duty something you enjoy doing. Suppose, however, you didn’t enjoy it. Would you still do it? Can you criticize someone else for not doing it. So what is my suggestion? If you want to know what millenials (the favored target) or any other generation or group of people want, ask them. If you’re wondering what sort of worship experience would attract them, not only ask, but ask them to lead. It might take you to the beach. You might wind up in a laboratory. You might wind up in a soup kitchen. You might even end up with something very old, like the worship service described in 1 Corinthians 14 with everyone participating, bringing thoughts, songs, things they’ve heard from God during the week. So what? Peter denied Jesus and then Jesus left him in charge, more or less. He did provide him with a bunch of other losers—by the world’s standards—to help out. Besides, you and I have been regularly making lots of mistakes for years. Lots of them. Instead of running the church, let’s offer them our help and support. Let’s see what they do with Jesus. Several things I’ve written lately lead to thoughts on ecclesiology, though that is hardly one of my subjects. People do sometimes make assumptions because I’m a member of a United Methodist congregation. So I’m going to make this personal, first saying why I am in a United Methodist congregation and second saying what I see as ideal in a church. This is just a bit of rambling—fair warning! I prefer to call myself a Christian who is a member of a United Methodist congregation rather than a Methodist. That can be clumsy, but I don’t think of myself so much as a member of the denomination as of the local church. There’s a fairly simple reason why I’m part of a UMC, and that reason can be found in the early pages of the United Methodist Discipline. While I am hesitant to identify fully with a theological stream, the doctrinal standards of the United Methodist Church come closest of any I know to what I can affirm. There are less restrictive statements I could also affirm, but they tend to affirm too little, in my view. My great disappointment with United Methodism is that so few Methodists are aware of this theological heritage. I’ve written about this before. The pastor of the first United Methodist congregation I joined confessed to me later that when I came to his office and borrowed a copy of the Discipline, he thought it was likely I would never return. If I had read the later parts about organization, committees, and so forth, it’s quite possible I would have been driven off. Sometimes I feel one requires legal training to navigate the authority structures of a United Methodist congregation. I should confess that, in addition to a lack of training in church administration or ecclesiology, there is another reason I’m utterly unqualified. My attempts at involvement in church politics or governance have not been terribly successful. They have generally been bad for my health and not very constructive for the church. I do well in one on one encounters. I’m much less successful at committees. And whether they call them “teams,” “working groups,” or just “committees,” these groups of people make a UM congregation run—or not. My observation is that most Methodist churches function because the actual power structure knows how to work its way around the paper power structure. That could be excessively cynical. When I joined my current church, I told the pastor that if he needed someone to park cars or teach Sunday School I was there for him, but if he needed someone to be on any committee, count me out. But my ecclesiology is not formed particularly by the structure and order of the United Methodist Church. I find that the hierarchical system tends very much to spend its time maintaining the institution and then wondering why the acknowledged work of the kingdom isn’t really happening. Pastors are moved in an arbitrary way, often without regard to the state of whatever ministry they’re carrying on where they are. Relationships between pastors and churches are hard to form, unless the church is large and has a greater influence on who will be on the staff and how long that person will stay. That set of complaints may sound negative, but I don’t see the United Methodist system as horribly deficient either. It has its problems, but in my experience so do all other systems of governance that involve humans. While the UM system may move a pastor when he really should stay, congregational systems often pair dysfunctional pastors and congregations until both pastor and congregation are spiritually dead. While the hierarchy may make for a certain amount of political structure maintenance, it also provides both connections to other places, and can move a dysfunctional pastor before he or she does more damage. Large structures allow the church to bring a wide range of resources together to accomplish great things. Unfortunately, I don’t think that either system guarantees that any of these great things will be accomplished. the combined resources of a large denomination could do great things, but they often get siphoned off to maintain a great headquarters building (or something similar). Summary: Every kind of church structure I’ve experienced (and I haven’t experienced all) has it’s problems and its benefits. While there may be a form of organization that’s better than any other, I’m not sure what it is. 2) Because there are many forms of ministry, everyone in the congregation is set apart. I’d like to be part of a congregation where the assumption is that everyone will have some sort of service. Let’s lose “member” vs “attends” and think of “attends” vs “active.” In my book Identifying Your Gifts and Service: Small Group Edition, I call for every member to become a gift spotter. The assumption should be that being part of the body means exercising gifts for the body. 3) Communion, preferably in the form of a common meal, becomes the center of congregational gathering. This would be what we do for a “worship service.” I have a fairly high, sacramental view of the communion meal combined with a rather low view of ordination. I think the Spirit of God in the congregation is what should authorize communion. I don’t believe that there should be a distinction between clergy and laity, but rather a distinction between different varieties of servants. We set people apart not because we make them better than others, nor because we acknowledge them as better than others, but because we acknowledge that they serve in particular ways with particular gifts. When this time of communion occurs, I believe that God is really present in the elements and in the people through His Spirit. 4) Leadership is strong, but is plural. There is no single person whose personality is stamped on the church. I believe this can be carried out under many different types of polity. One of the weaknesses in the Methodist system is that a pastor gets a level of respect because he’s sent by a bishop, and the bishop is way up there, so to speak. So the church centers around the pastor’s views and wishes. A pastor who wants to have a successful career will tend to work the nomination system and stack committees, especially the Staff-Parish Relations committee. Then a new pastor will come, and he may have a different personality. I believe that a church needs to have more people who exercise real leadership. I know there can be real problems with this, but as I’ve noted before there are real problems with any system that involves people. 5) The church builds connections with a variety of other churches. The Methodist system speaks of connectionalism, and this is a great characteristic. I’d prefer to see a greater degree of connection between churches of different denominations down the street. So I see connections as important, but I think that they should not be restricted to one denomination. 6) The church is accountable in some way. In the Methodist church, this accountability is to the bishop and to the structures of the church. I think more independent congregations can choose to be accountable. The only way to know what’s going on is to observe. 7) The church has an identifiable, known set of theological essentials and affirms freedom in other areas. I know this stresses people out on all sides. Some don’t want any definition. Others prefer very limited freedom of teaching. I think the most mature congregation will be produced by having a carefully chosen and defined set of essentials and then allowing free discussion outside of that. I think there are many topics that should be non-essential and open to a variety of views. 8) The majority of church income is used for outreach and service. As long as the majority of our money and effort is used to maintain the physical structure and the political forms, I don’t think we’re where we need to be. To be clear, what I mean is more than 50% of the money received by the church is going somewhere other than maintaining the congregation itself. Since I’ve been told that 5% is considered “mission minded” for a United Methodist congregation, I think this may be the hardest one. There’s the saying that if you find the perfect church, you shouldn’t join it. You’ll spoil it! I don’t think this is the perfect church, but it’s one I’d be willing to try to live up to. Note: As a publisher, I publish some books by people more informed on these topics. 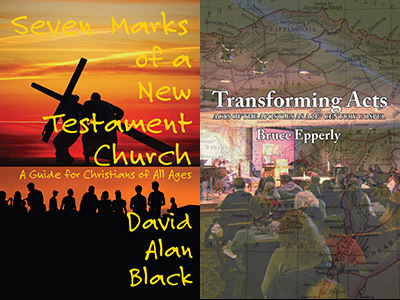 I’ve been particularly impressed with two recent releases from opposite sides of the theological spectrum, Dr. David Alan Black (Southern Baptist) and Dr. Bruce Epperly (United Church of Christ). Dave’s book is Seven Marks of a New Testament Church and Bruce’s is Transforming Acts: Acts of the Apostles as a 21st Century Gospel. It’s interesting to see people from across the theological spectrum looking back to the book of Acts and the early church to learn how we might move forward in the church today. Don’t blame them for my ideas. Each has his own, and they are both worth reading. As a publisher I have the joy of spending a great deal of time with a book as it goes through the process of publication. I don’t expect you to read my thoughts on The Jesus Paradigm as anything like a review, but there are some special things about this book and the way it has influenced me as I worked on it. I like to think of my business as a ministry, which is “churchese” for “service.” It is my intent to serve both the church and the community with materials that challenge and educate. Now don’t get me wrong here. For a small publisher, signing an author who has written nearly as many books as the company has published is a sound business decision. I didn’t decide to sacrifice myself in service and publish this book contrary to my better judgment. It’s a good book; it’s a book that is likely to sell quite well; it’s also a book that is kingdom building. Now as I frequently must, let me warn you that I’m going to be writing quite a few words. I’ve been thinking about the concept “church” for a long time and struggling with many things. This is also largely addressed to a Christian audience, so it may well bore others. Read on at your own risk! What happened with this book was that a number of things I’ve been thinking about, things that have challenged me over the years, came into sharper focus while I was editing and preparing it for the printer. I traditionally point out about now that I disagree with some things in a book I’ve published, and that this is a good thing rather than a bad thing. That’s part of developing brand identity since in a company founded by one person, it’s easy to confuse the person with the company. But in this case I think anyone who looks at the header of this blog and reads a few essays, and then does the same thing on Dave Black Online will be in no danger of confusing the two of us. What I think I need to emphasize instead is just how much I agree with in this book, and the tremendous value I find even in the things about which I have reservations (ecclesiology) or differences in emphasis (hermeneutics-maybe). Some Christians argued with me that such a total surrender as I described was not required, but I could not see a partial surrender to God at the time, and I still can’t do so. Despite believing that, I have struggled with how to put that into practice, particularly in church life. The extent to which “church” doesn’t work, or perhaps doesn’t appear to be what it seems the Bible points to, has continued to bother me. Let me list some of the threads of thinking that have bothered me. (1) Again as I note in my testimony, I felt God’s call to ministry as I was registering for the second year of a pre-law program. I switched to Biblical languages. Unfortunately I found that while many people would talk about a lack of Biblical knowledge in the pews, the church had no place for a teacher who was not also ready to pastor a church. I observed that pastors got overloaded and rarely had a chance to actually teach. (2) If you look at most pastors and then write up a job description as you might for a business, you will see a job that nobody can actually perform. Our pastors cannot lead, teach, and equip, because they are so busy doing, and not necessarily doing the things that truly go with their calling. (3) I grew up with missionary parents who were truly dedicated to their work. By this I mean being willing to go out to serve God at risk of life and limb and at times depending on God for their next meal. I spent four years in southern Mexico, and then three in Guyana (South America) and while we were in the United States, they worked in underserved areas. I experienced mission trips as loading up mules and backpacks and hiking to a village, or in Guyana getting in a boat and heading up river. This gave me a different view of “discomfort” than I have encountered in various short term missions in which I have been involved. I experienced worship and teaching in circumstances that varied from outdoors under trees to small, simple churches that were no more than walls and a roof. I have felt the presence of God in places most Americans would regard as unusable. (4) By contrast, I have sat in American churches that would be inconceivably luxurious while people debated the color of the carpet for hours. Somehow I just couldn’t get into it. We’re replacing chandeliers that don’t look just right; Christians somewhere else are trying to do the minimum necessary to keep out the rain. (4) I have wondered just how we could create a church that would carry out the work of the gospel as its primary mission. I don’t like evaluating ministry purely on a numbers basis, but I believe that you can often calculate what real priorities are by looking at where the money goes and secondarily by looking at how time is used. By this measure the priority of American churches in general is neither social service nor gospel preaching but rather self-maintenance. Enter The Jesus Paradigm. In a sense it is almost fitting that the author, Dave Black, contracted Malaria while in Ethiopia and the book was released while he was in the hospital. As I have noted recently in writing about 2 Corinthians, the person can be inextricably linked with the written message. Paul didn’t want to boast, but he had to, while at the same time defending himself from the charge of weakness by claiming that he was weak. In some of the reviews and in comments brought to me personally there have been questions about a number of things that are either lacking in the book or that people question. I’m not going to try to defend this book by saying that every word is absolutely correct and will stand the test of time. I’m not trying to make Dave Black into a prophet or incorporate his book into the canon of scripture. These questions relate to ecclesiology and the lack of extended practical directions, both of which I will address, and the political commentary, which I will not. One major question has been the lack of detailed practical advice on how to put the message of this book into practice. I don’t like to criticize reviewers as a publisher, but I think that criticism misses the point. The way you put this into practice is by prayerful, constant surrender to Jesus. Read John 6:28-29. The problem is that we want a checklist, a program, or at least a detailed guide. The fact is that we have one–scripture brought to the moment by the power of the Holy Spirit. I recall from my experience here in Pensacola with the Brownsville Revival. Now please lay aside your issues with what was being done in that revival. I’m not pointing to Brownsville as an example. Pastors and church leaders would come from far away and they would want whatever it as they perceived that Brownsville had. So they would go back home and try to apply what they had seen at Brownsville. They would use the same music, not just the same style but the same songs. They would organize their services in the same way. They would try to style their preaching after the revival preacher Steve Hill. Then they would wonder why it didn’t work. It didn’t work because kingdom service is not a program, nor is it a checklist, nor is it an organizational manual. It’s a surrender. If you don’t know how to do this, dig into Acts and the Epistles, though only after you’ve thoroughly dug into the gospels. Spend your time in prayer and study and in listening to what God has to say to you. You will find ways to put the Jesus paradigm into action. Another issue is with ecclesiology. How can this material be applied to a different structure of church than just Baptist? Here we may certainly have many disagreements as to details. These are good to discuss with the proper spirit. I can look at this from my Seventh-day Adventist background and now as a United Methodist, and I think that the most critical thing here s the way church leadership thinks of themselves and behaves. I believe a Methodist church pastor could spread the Jesus paradigm through the committees of teams of his church structure just as boards of elders can do so in other church structures. But the bottom line, in my view, has to be more revolutionary, but again I think it applies to all different structures. The issue is this: Where do our resources go? Do they serve our desires or do they serve others? As I have looked at the church budgets of the churches I have attended over the last few years, the vast majority of the budget goes to buildings and staff salaries, and the staff is largely charged with maintaining the members that are already there. As long as we’re spending the majority of our money on maintenance, we’re not going to be reaching people as we should either in social services or in proclamation of the Christian message. This is why I’m so delighted to have the opportunity to publish The Jesus Paradigm, and yes, to have the opportunity to market it as well. It will challenge us to apply this “downward path of Jesus” (also a phrase from the book) to our circumstances wherever we are. It will direct us to Jesus himself and the early church to find ways of doing that. I don’t think this will necessarily be simple, but I think it’s time for us to be praying, thinking, and listening for the Holy Spirit in regard to how we can accomplish it. Otherwise, our churches are just an extremely expensive and annoying form of social club. Let me remind everyone that I’m really thinking on my blog, rather than providing answers that I have really thought out in discussing health care issues and the church. I have lots of pieces, but I don’t feel that I have anything like an assembled puzzle. My comments will also necessarily derive from personal experience. And as always, I tend to ramble a bit! One direction from which we can come at this issue is from the question of need. What is it that a person needs from their church community when facing either illness or death? Since Mark brought up especially end of life issues, I’m focusing on this, including life-threatening illnesses. Several times when we’ve gone into the children’s wing of the hospital where our son received chemotherapy, my wife has commented that the real enemy is not cancer, but fear. I confess that the first time she said that, my reaction was a bit bewildered. Yes, I know that we have to fight fear, but we’re putting all of these chemicals into a child’s body for the purpose of killing the cancer, hopefully before they kill him. That’s surely fighting the cancer! But she has a point. The real difficult thing about illness and eventually facing death is the number of decisions that have to be made. Now my wife and I obviously were not facing our own deaths, but rather the death of a child. At first I was less involved. I was the step-father, but then James had to face the death of a loved one during his own struggle–his father died of a heart attack. After this I got a new perspective, because I was the one to go with him to doctor’s consultations. I remember his response vividly. He had only known about his father’s death for perhaps 15 minutes when he walked up to me and said, “Well, I guess it’s all up to you now.” Thought it wasn’t “all up to me,” he had a point. The thought of death does something to us, even as Christians, that I think makes us irrational. I say (and confess) “us” even though I believe our family managed to step back. The first thing is to realize that death isn’t your worst enemy. I say that not merely as a Christian who believes that there is more for us after this life. Leaving that aside, the process of medical care can be much more terrifying than the thought of dying. To be honest, I don’t know how most people do it. I grew up in a medically oriented family. We discussed health issues around the dinner table. We talked about dying as a pretty ordinary topic. We talked about the choices in medicine constantly. My wife is an R. N. and has 12 years experience as a hospice educator. With all that background available, we would get into a doctor’s office for a consultation and become hopelessly confused. I remember one consultation after the first recurrence of the cancer. The oncologist was outlining treatment options. I could look at James and see him tuning out. I told the doctor that I had the role of being the idiot and started asking him detailed questions, making him explain the treatment options, their impact both in terms of effectiveness and side effects. By being the complete idiot and making him go into ABC mode, I got the information. I’m wondering how many people would push that hard, or know when to push. He was a good doctor, with an excellent reputation, and we liked him. We ended up taking “none of the above” and going with a plan cooked up by a surgeon at another hospital. You don’t have to be down all the time just because you or a family member is ill. A number of people took me aside because they felt they needed to let me know that Jody (my wife) was in denial, and didn’t understand the seriousness of the situation. She was much too cheerful. All things considered, I suspect the hospice educator was adequately informed. I was happy that there were times when she could be cheerful. Repeat that point for James. I don’t know how many times I was told he didn’t understand his condition and the fact that he could die. When he first went into treatment he wasn’t all that clear, but by the time it was all over he could educate most adults on cancer, death, and dying. Again, any time he could be cheerful was good. Before his father died, he and I had an agreement that we would just have fun, so I never brought up the illness when we were together unless absolutely necessary. Of course later that had to change. Church members (or any friends and relatives) need to be aware that you don’t need someone to be miserable with you. Often it’s nice just to have someone be normal and do normal things. It is impossible to follow every diet, special remedy, or treatment plan found on the internet. We were frequently presented with complete solutions discovered via the internet, ranging from eating lots of brussels sprouts to buying a several thousand dollar water filtration system. It was OK for people to suggest, but when they followed up to see if we were following their suggestions it was a bit much. Similarly, you can’t go to every faith healer, preacher, prayer team, special revival, or healing service that is offered. We had people who were desperate because they thought if we didn’t go to a particular place, James would not be healed, but if we did, healing was certain. One Sunday near the time that James went home we all skipped church and met in the living room. Some of our family members had been hurt by things they had heard. I pointed out that the people who did the hurting were not intending to, but that they were very likely operating from fear. If you can find a reason why someone else is suffering, then you can feel that you won’t be targeted. On the other hand if they could be convinced that the right prayer would result in certain healing, they could feel confident that if that nasty diagnosis came in, they could handle it. The idea of losing a child to cancer is so horrifying that we’d like to find a reason, and specifically a reason that doesn’t apply to you. Good luck! I wish anyone who does this the best in making yourself feel confident. But bad things do happen to generally good people, and whatever comes up as your lot, whether you look at is as God’s plan, or just the way things work in this world, you’re going to have to deal with it. So what does a church do as a community about this fear? I found that there is one key, and that is staying together and sharing. James had friends who drew closer, and he had friends who couldn’t handle being with him in the fire of affliction. We have been so amazed and thankful for those friends who stuck with him. The majority of those were a few years older than he was, and that difference got more marked as time went on. He simply no longer talked about the things that the boys his own age were interested in. But there were a number of close friends his own age who walked the walk with him. There are others I know who have regretted it. Simply staying friends, remaining part of the community, and allowing the portions of life that can go on normally to do so is extremely important. There’s such a thing as dying while you’re still alive. James made an early decision not to do that. His final summer he started out in marching band for his high school. He made a difficult decision to step out because he realized he wasn’t going to be strong enough to march that season and indeed would probably not live through it, but he continued to join them on the field, and help with those things he was physically capable of doing. He made a conscious decision that death wasn’t going to stop him. The rest of us had to go along with that! And it was the right decision. The fear can destroy you long before the disease does, and make your remaining days a living death. There is a value here in education, but that needs to be supplemented by active support. “Support” as I’ve said, isn’t a matter of having the right thing to say all the time. It’s a matter of simply continuing to be connected even when you don’t know what to say. I already knew all the words. The problem wasn’t to know what I ought to think. The problem was to get the encouragement and strength that comes from community. The ones who showed up and felt foolish, or so they tell me, didn’t hurt us in any way. Generally we had no idea they were as clueless as they claimed. We were just glad they were there. The folks who melted away–those hurt. Most churches need to really reorient their thinking to truly be a community. The response to every problem is to have a program, and designate people. And of course we do need designated leaders and programs can help. But it’s not the designated people who showed up that helped. It was the close friends who remained and got closer. Peter Kirk posts on the church congregation of which J. I. Packer is a member, which has voted to leave its diocese and join the southern cone. This is not in my denomination, but it is becoming a more and more common issue as various denominations turn leftward, and conservative congregations try to leave their denomination. There are two issues that concern me a great deal. The first is about the treatment of J. I. Packer. Now you don’t have to read more than a few posts to realize that I’m not very near J. I. Packer on the theological map. But I think those of us who are moderate to liberal in persuasion need to make sure that we treat people who disagree with us with a certain degree of respect. I am open to correction on this, but I fail to see where Dr. Packer has done anything to warrant this type of treatment. It appears to just be an attempt to silence him, and probably not a very effective one at that. But second, this reminds me of a number of cases in this country in which property issues have landed churches in court. Now I don’t see that happening here in this particular case, but in many cases here in the United States, congregations are winding up in court over church property. There is very little value, I think, if a denomination keeps a piece of property, but loses the members. When the dust has settled, and when we all stand before the great judgment seat of Christ, I don’t want to be the one who took a congregation to court over property issues. I can see some technical justification, but I think with Paul that we should say “It would be better to let yourselves be cheated and robbed” (1 Corinthians 6:7 CEV). From a Christian point of view this treatment of Dr. Packer seems to come from the same angle. It looks like a rather unChrist-like attempt to score points because someone annoys you. Liberals should be in favor of openness. More importantly, Christians should treat one another with respect, and treat an elder with due respect. This looks like scoring cheap points. Update: Can I use the illness excuse again? I somehow missed the fact that there is a property issue in this case. So it is more precisely an example of the issue I’m talking about here.